You're Invited... to Francesca's Collections Grand Opening! Join me in celebrating the grand opening of Francesca's Collections on Saturday, July 16 at 10:00 AM at Woodland Mall in Grand Rapids, Michigan! 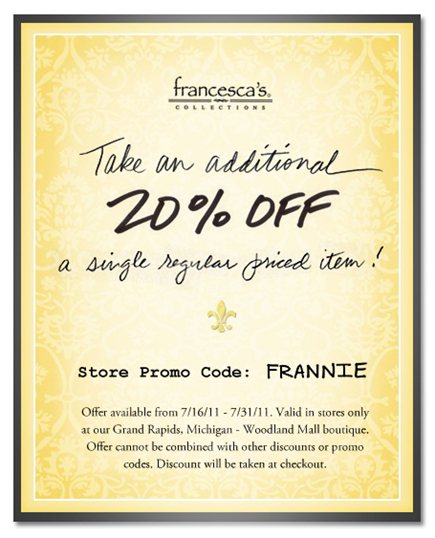 I've loved working with Francesca's Collections and helping to promote their darling clothes. Shopping in their store is so fun because you get a really personal, boutique-style experience! You can meet me there at 10:00 AM for some shopping and be sure to mention the "frannie" promo for 20% off a single regular-priced item! See you there!